A relatively compact and easily laid out town centre, it is easy to find your way about. Mobility around Stratford is varied and you will find something for everyone. If you are arriving by coach or bus there are taxis and tours available for you to take. The rail station is just 5 minutes brisk walk into the town centre and is also serviced by a taxi rank. In addition to the normal county and local bus services there is a fleet of open topped tourist buses complete with commentary. For something different you can a hire a guided tour around the town streets in a horse driven carriage. If you wish you can hire cycles or if you are able then there is always good old shanks pony and there are a number of guided walking tours around the town. 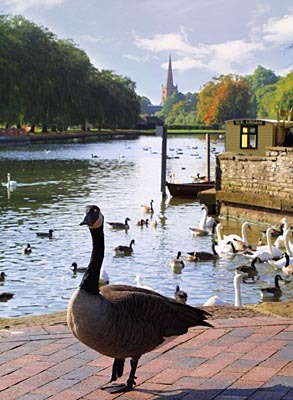 You can even travel to Stratford by Boat or take a trip on the riverboat whilst visiting the town, either row your own boat or take a short powered boat cruise. If you are travelling to Stratford by car, there are a number of on-street parking places ranging from 20 minutes to 2 hours and several long stay car parks - enough parking to accommodate all. For references to Car Parks please refer to our map. Shakespeare Tours provides an executive taxi service across the UK and an airport taxi collection/delivery service linking Stratford-upon-Avon, Warwick and The Cotswolds to the UKs major international airports and railway stations. We provide private hire and transfer services to and from all major UK airports such as Birmingham International, East Midlands, Manchester, Luton, Stanstead, London Heathrow & Gatwick, as well as railway stations such as Birmingham New Street, Coventry, and sea ports like Harwich, Ipswich and Southampton. Servicing: hotels, guest houses, companies and individual customers in Stratford-upon-Avon, its neighbouring towns of Warwick, Leamington-Spa, Banbury and the rest of South Warwickshire, North Oxfordshire and Gloucestershire. Fully Air-conditioned, Luxury 1 to 8 seater with luggage availability and Wheelchair Accessibility. Professional Service Airport & Station Transfers (details) Private & Corporate Events - Corporate Transfers Local & long Distance Promotional Events - Wedding parties - Bespoke Cotswold Tours - Golf Trips - Theatre Trips - Advance Bookings Welcome - Meet & Greet Service.